Woodlawn Foundation: Who We Are. Woodlawn Hospital is a non-profit organization. The hospital is a county-owned facility; however, it receives no county tax money for its day-to-day operation. Our growth depends upon our wise use of operating funds and the generous support of our community. While any contribution carries its own rewards and personal satisfactions, the Woodlawn Foundation publicly recognizes all contributions in two ways. First, contributions are recognized as they were given, placed on the appropriate plaque in the hospital corridor, and listed in our community newsletter. Second, gifts are recognized on a cumulative basis. An ongoing record of all contributions is kept, which allows periodic recognition of the cumulative amount of contributions. 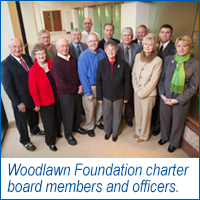 Woodlawn Foundation, Inc. is a 501(c)(3) non-profit recognized by the Internal Revenue Service. Gifts are tax-deductible and can be given as gifts of: cash, stock, personal assets, bequests, insurance, trusts, and annuities. For more information on the Woodlawn Foundation, please call the Director of Community Relations and Foundation at (574) 224-1179 or send an email.